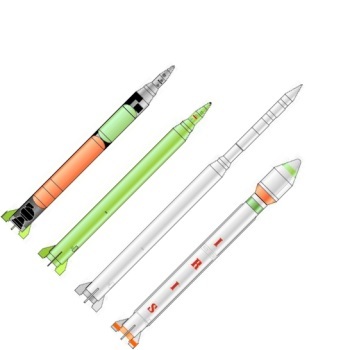 From left to right: cutaway and exterior views of Shahab 3 stretched missile; probable appearance of an orbital launch vehicle version; orbital launch version as displayed in a model in Iran in 1998. Iranian intermediate range ballistic missile, evolved incrementally with Russian assistance from initial copy of North Korean Nodong 1 into a longer-range missile and the first stage of an orbital launch vehicle. Initial version began flight tests in 1998. Status: Active. First Launch: 1998-07-22. Last Launch: 2012-07-03. Number: 9 . Payload: 700 kg (1,540 lb). Thrust: 255.00 kN (57,326 lbf). Gross mass: 14,500 kg (31,900 lb). Height: 14.82 m (48.61 ft). Diameter: 1.19 m (3.90 ft). Apogee: 150 km (90 mi). On 7 July 2003 Iranian state radio reported that the final trials test had been conducted a few weeks earlier and the missile had been accepted by the military. It was also reported that the larger Shahab 4 missile had been cancelled, since the Shahab 3 had been provided with a greater payload in its place. Western sources indicated Russian technology was used in the improvement of the Shahab 3. In November 2004 US intelligence sources stated that the version of the missile used in 2004 tests had been stretched 15% and equipped with a larger payload fairing, indicating possible preparations for the long-announced Iranian indigenous satellite launch. A stretched Shahab-3 with improved performance, topped with two upper stages, would be equivalent to the French Diamant launcher of the 1960's. It would certainly be capable of orbiting the 60 kg Mesbah satellite mentioned in the press, and possibly the 170 kg mentioned for the follow-on satellite. Maximum range: 1,200 km (700 mi). Boost Propulsion: Storable liquid rocket. Family: IRBM, Shahab. Country: Iran. Spacecraft: Omid. Launch Sites: Sriharikota, Emamshahr. Stages: Shahab 3 stage. Bibliography: 1823, 2, 433, 457, 8634. 1998 July 22 - . Launch Complex: Damghan. LV Family: Nodong 1. Launch Vehicle: Shahab 3. FAILURE: Failure. Test mission - . Nation: Iran. Apogee: 0 km (0 mi). 1998 August - . LV Family: Nodong 1. Launch Vehicle: Shahab 3. Iranian satellite launcher mockup exhibited - . Nation: Iran. Iranian television showed what appeared to be a mock-up of a clam-shell nosecone with a small satellite inside and a model of a space launch vehicle with a bulbous payload section, apparently based upon the Shahab 3 joint North Korean/Iranian IRBM..
2000 July 15 - . Launch Site: Mashad. LV Family: Nodong 1. Launch Vehicle: Shahab 3. Test mission - . Nation: Iran. Apogee: 150 km (90 mi). 2000 September 21 - . Launch Site: Semnan. LV Family: Nodong 1. Launch Vehicle: Shahab 3. Nation: Iran. Apogee: 1.00 km (0.60 mi). 2002 May 5 - . Launch Complex: Damghan. LV Family: Nodong 1. Launch Vehicle: Shahab 3. 2002 July 4 - . Launch Complex: Damghan. LV Family: Nodong 1. Launch Vehicle: Shahab 3. Nation: Iran. Apogee: 150 km (90 mi). 2003 June 1 - . Launch Complex: Damghan. LV Family: Nodong 1. Launch Vehicle: Shahab 3. Shahab 3 Test Launch 6 - . Nation: Iran. Agency: Revolutionary Guards. Missile built by Shahid Hemmat IG. 2006 January 17 - . Launch Complex: Damghan. LV Family: Nodong 1. Launch Vehicle: Shahab 3. Nation: Iran. Agency: IR. Apogee: 150 km (90 mi). 2011 Feb - . Launch Site: Semnan. LV Family: Nodong 1. Launch Vehicle: Shahab 3. 2012 July 3 - . Launch Site: Semnan. LV Family: Nodong 1. Launch Vehicle: Shahab 3. Shahab RV - . Nation: Iran. Apogee: 150 km (90 mi). Exercise mission..